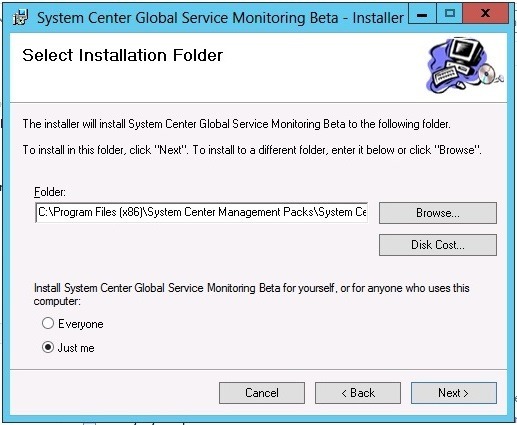 As a part of Service pack 1 for SCOM 2012, Microsoft has added a new feature called GSM (Global Service Monitoring) It allows you to monitor your services from Microsoft’s datacenters. Lets say for instance that you have a large web-shop in Europe. You can use GSM to monitor your web-shop from various location in Europe, for instance London or Paris. This would also pinpoint for instance if you have customers in France that have trouble accessing the web-shop but not in England you can view the GSM status to see if it has trouble accessing the service as well, or it is experiencing latency issues. The installation is pretty much next, next finish. 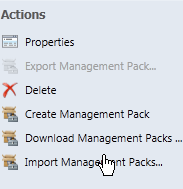 But after that you need to go into administration –> management packs and import the management packs. This just does a regular HTTP GET request to the webserver and if the service is available as it should it should respond with at 200 OK.
First of I forgot to install the Identity Provider (If you haven’t installed it, it will say so in the console. So from here you just enter the subscriptiob ID you got from MIcrosoft. 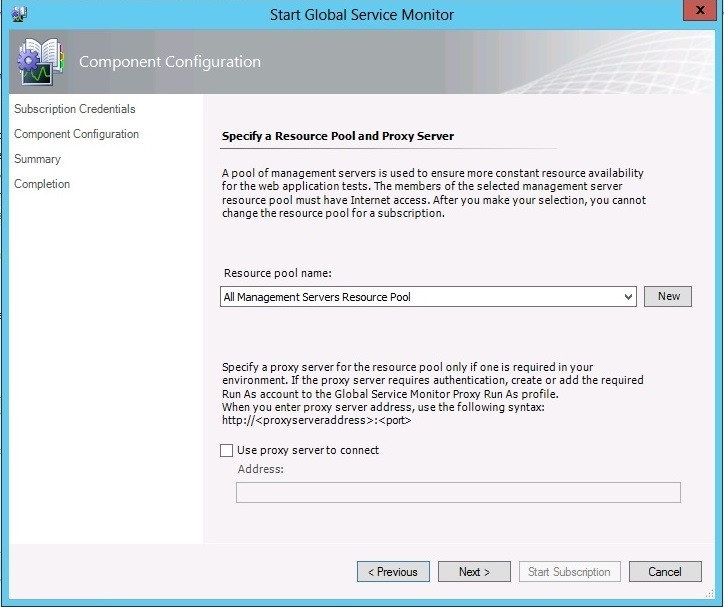 Next you need to state if the monitor requires to go trough an Proxy Server and which of the management servers have internet access. Give this monitor a name and place it into a management pack. Next we add values to what websites we want to monitor. So I choose Paris and add both sites, and the same for London as well. If I choose “Change Configuration” I can change what kind of reponse code from the HTTP server I wish to have and how often to poll it. Click then Next –> Finish. Now after the services are set up I can go back the the GSM pane and on the right side I can press View GSM tasks. Here I can now see that my monitoring for www.microsoft.com and www.vg.no are responding as they should on regular http get requests. 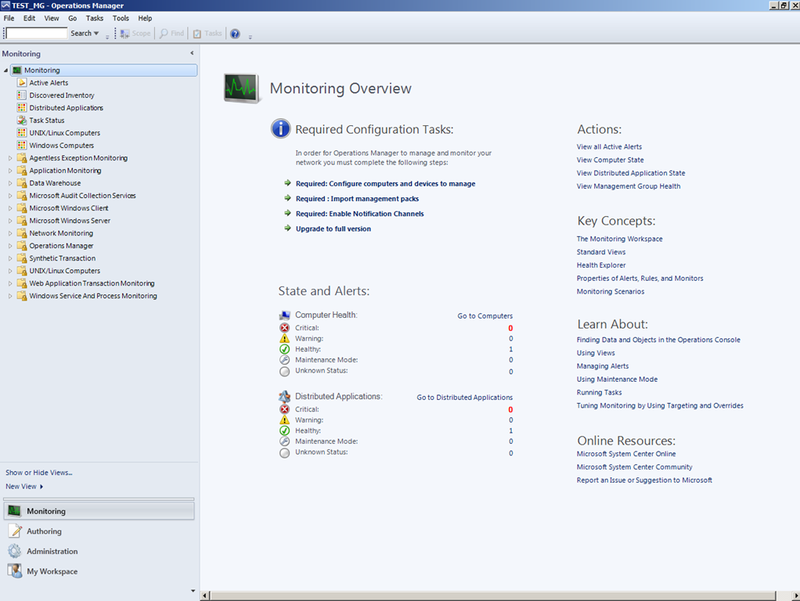 You can as well setup more complex monitoring such as TCP, services etc. if you wish. 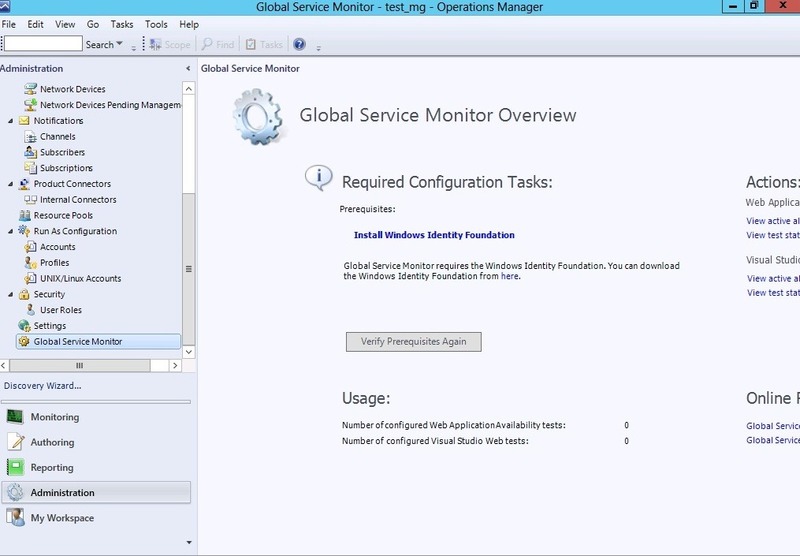 With SCOM 2007 you have the ability to monitor a service within your infrastructure with Distributed Applications. Distributed Applications are basically made up of different components that make your service. All these components make the service. So if one of these components go down your service goes down. 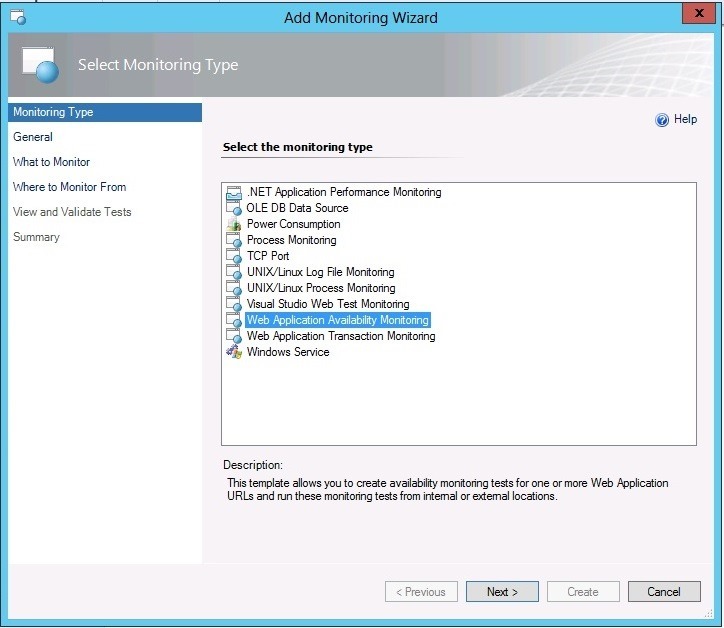 So Distributed Applications allow you to monitor your service, with SCOM 2012 you have a better options of monitoring the SLA (Service Level Agreement) for that service. 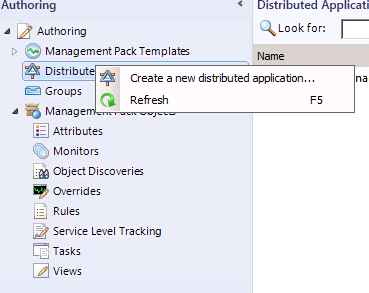 IF you wish to create a new DA monitoring, go to the authoring pane, and choose Distributed Applications right click and choose create new..
Give the DA a describing name and description. There are already some templates avaliable to choose from but we are going with the Blank one so we can cover all the steps. And always put the DA in a separate MP, for instance you should have one MP with all the DA. 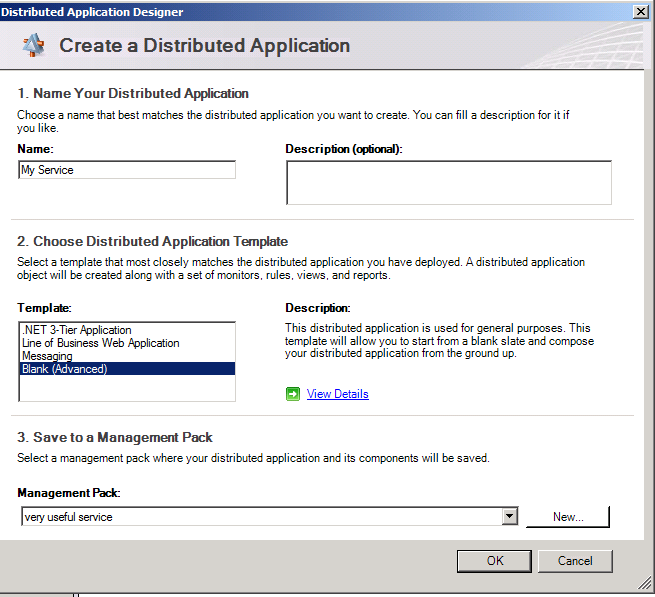 Then click OK, Now we enter the Distributed Application designer. From here we draw how the different components are attached to each other, on the left side you have the search fuction so we can find the different compoents we wish to add. For the purpose of this post, I’m just going do create a new SCOM DA. 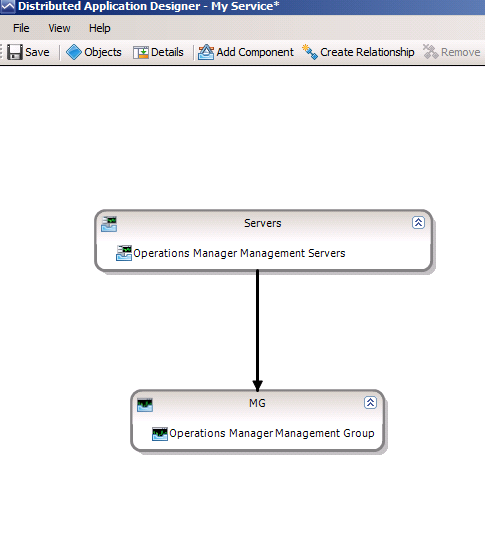 First of now I just added the Management Servers from the left side as an component, next I add the Management Group to the mix, and then I create an relationship between the two, since the servers depend on the Management Group. 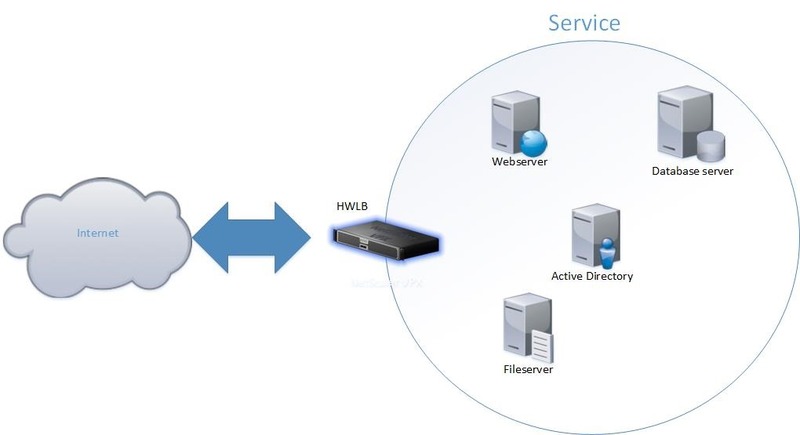 As an example, the webserver is dependent on the database server to get its information, the database server on the other hand is not dependent on the webserver. The designer window will now look like this. Now lets save this layout. Click the Save button. 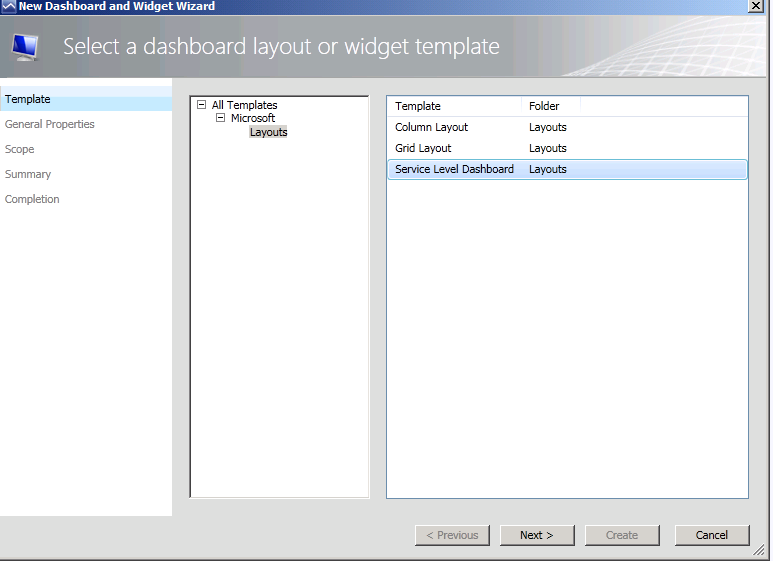 Now back in the authoring pane you will now see the newly created DA. Now we are going to create a SLA monitoring. 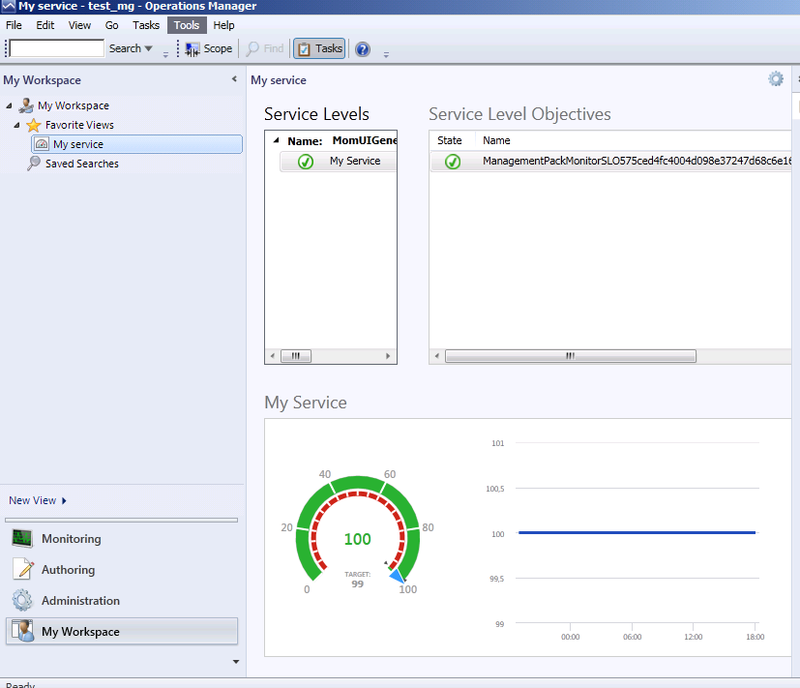 Further down in the authoring pane you can see the Service Level Tracking. Right click and click create. Give it a name and choose the new service as a target class. Next under service level objectives click Add. Give it a name, choose Availability type and leave the rest at the default. Since will monitor SLA based on critical events on the target “My Service” DA. So if a critical event were to happen on that service my SLA would fall. 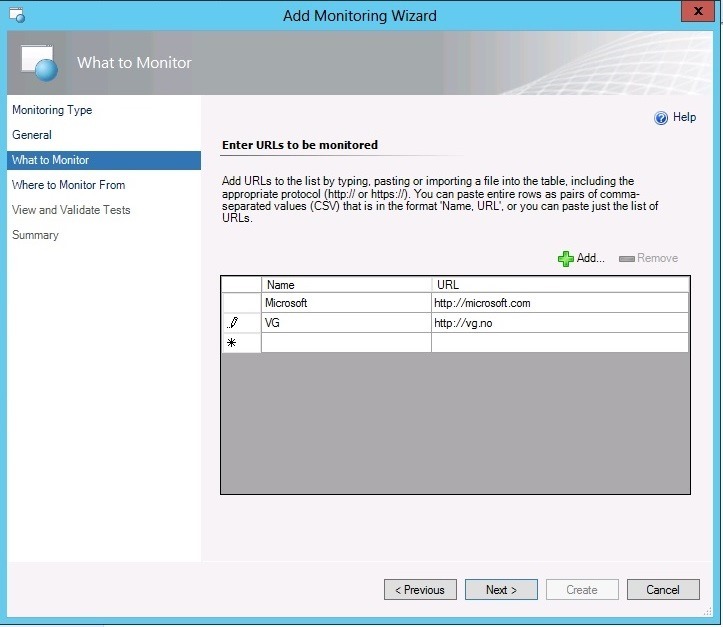 After you have created the SLA monitoring go back to the my workspace pane, Right click on my workspace and press new dashboard view, and select Service Level Dashboard. Under Scope add the new SLA monitor you just created, (You could for the record here add multiple SLA’s to view on the dashboard. And choose the time scope (Default is 24 hours) click next and create. You can now see that the new SLA widget appears under Favorite viewes and I get a fancy overview of the SLA for my DA. 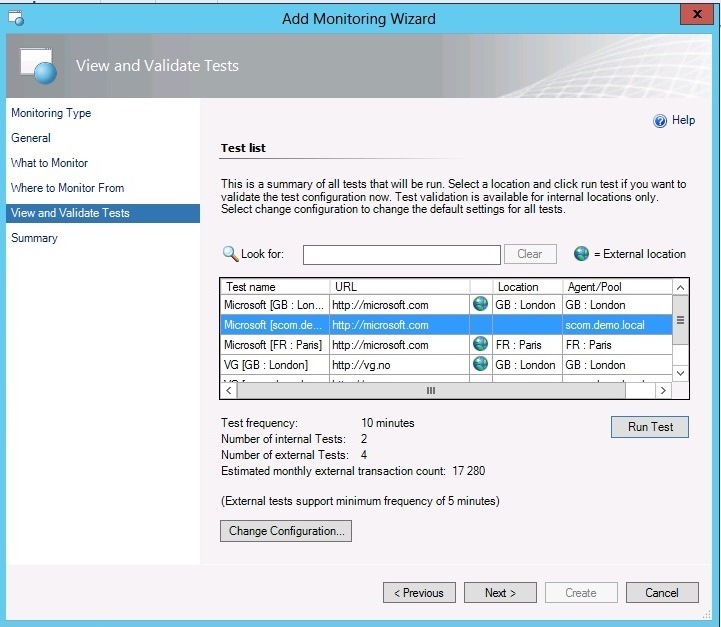 ill give more detail when regarding monitoring of a large service including network devices and SAN solutions in a later post, but this is just to give you the general idea of how you can monitor your services using SCOM 2012. Now that we covered the basics, we start by installing it. 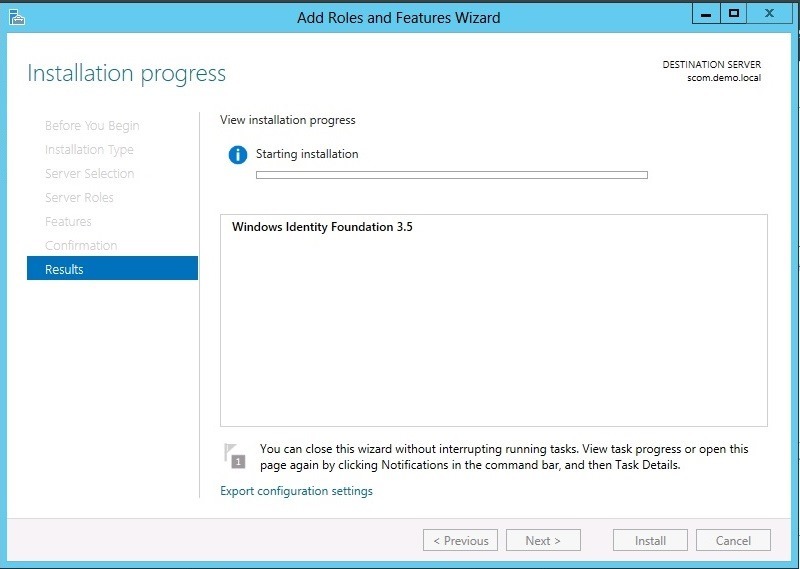 Next is about installation location, leave it at the default. 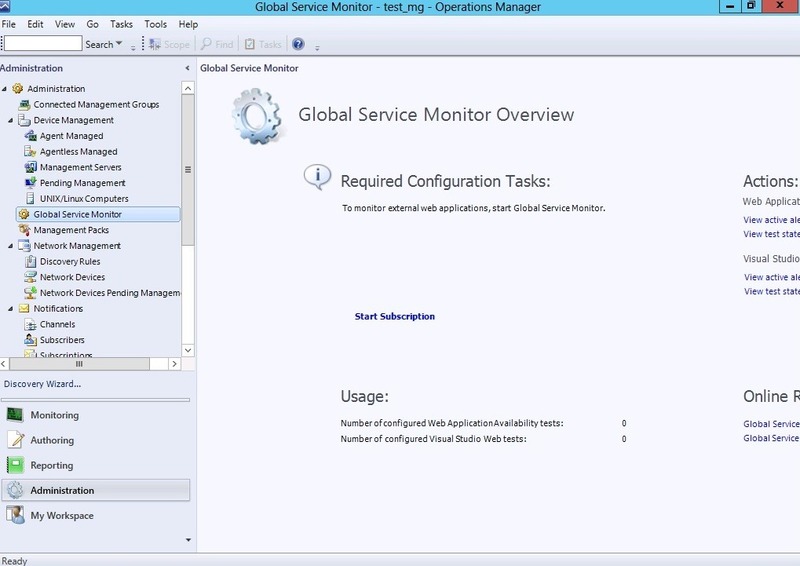 Next the setup, verifies that you have the required hardware & software in order to run OpsMgr. 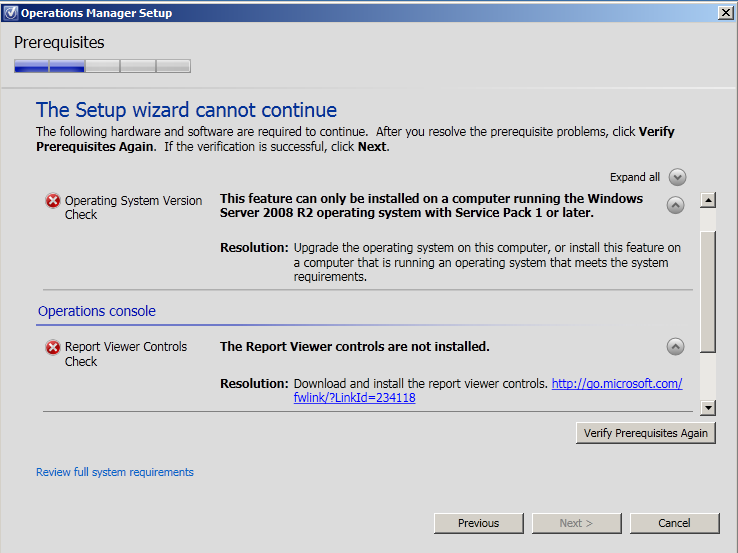 In my case I forgot to update my server to2008 R2 SP1 and I forgot to install the Report Viewer Controls. Of course those are pretty easy to fix. (Can’t figure out thou why Microsoft couldn’t put the setup for Report Viewer on the installation media ) So after you’ve installed SP1 and installed the Report Viewer Controls run the setup again. Now that’s done I can continue with the setup, next you create a management group. This is unique for each instance of OpsMgr so choose a unique name if you have muliple instances. Click next, accept the license terms. Then Click next again, now we come to the DB setup. 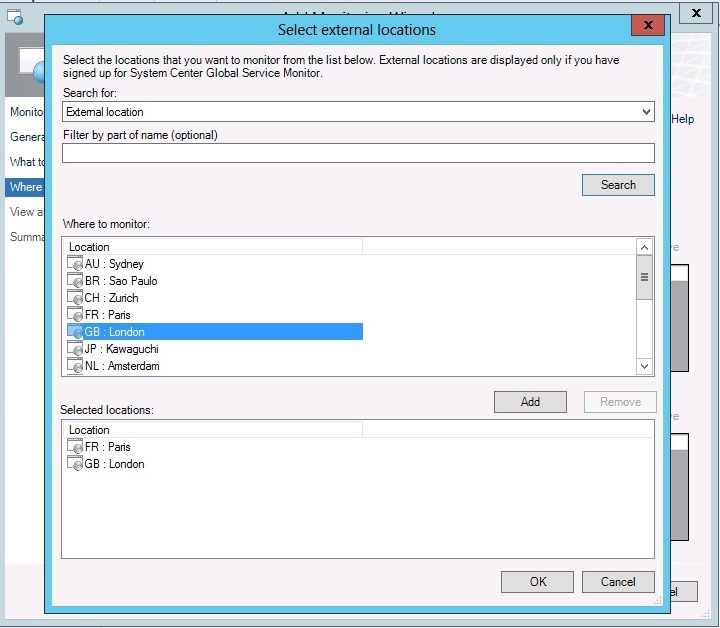 Enter the name of your SQL server, and the setup will automatically connect to it. reporting services uses & for the long term data storage. After you are done here, click next. 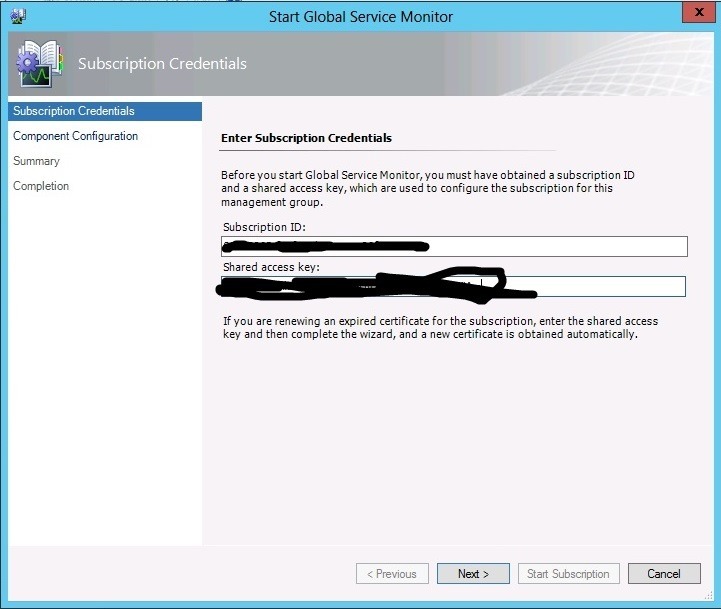 Now we get to the service account setup screen. A little info about the different accounts. This account is used to carry out actions on monitored computers across a network connection. This should be a domain account, which has local administrative rights. This can be either a domain account or run as local system. 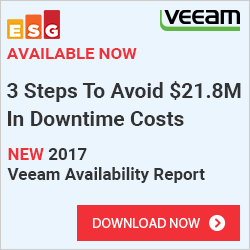 For cases where the operational database is hosted on a remote computer that is not a management server, a domain account must be used. For security reasons, don’t use the same account as the MSAA. 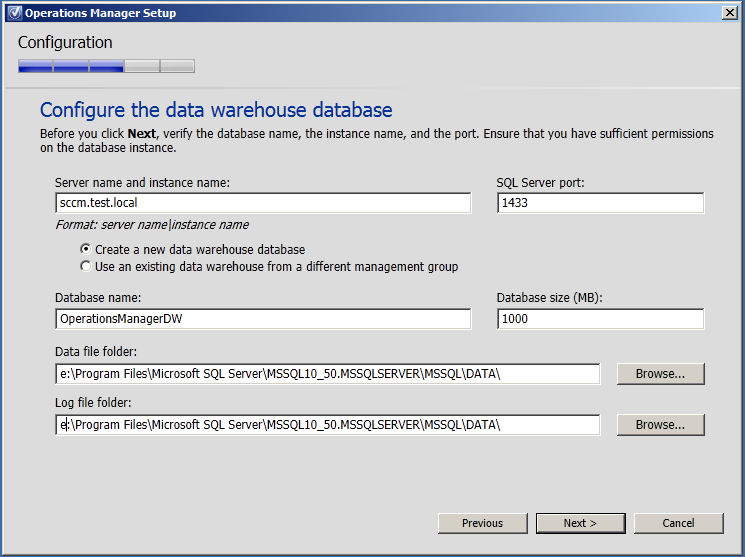 The Data Warehouse Write account writes data from the management server to the Reporting data warehouse and reads data from the operational database. 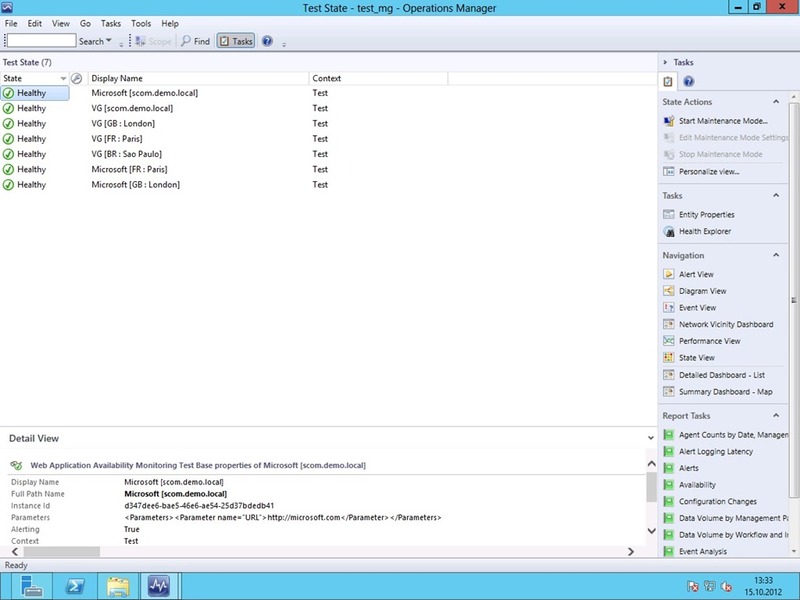 This account is assigned write permissions on the Data Warehouse database and read permissions on the operational database. 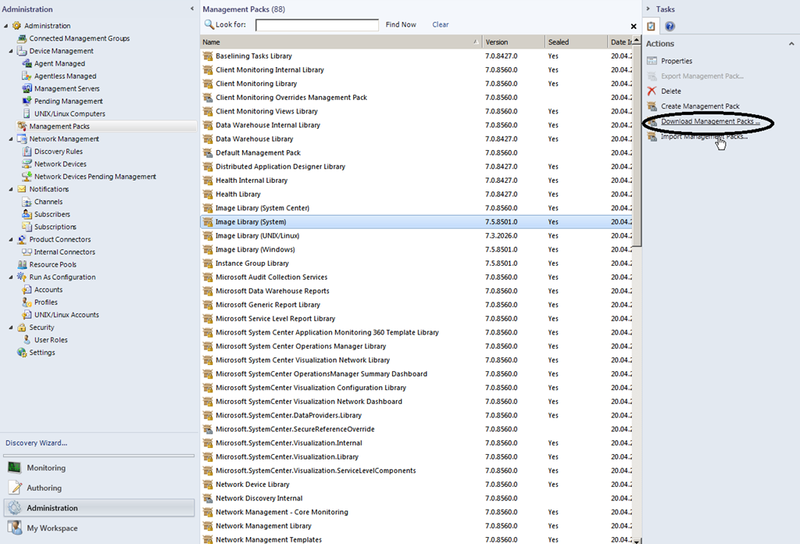 The Data Reader account is used to define which account credentials SQL Server Reporting Services uses to run queries against the Operations Manager reporting data warehouse. Ensure that the account you plan to use for the Data Reader account has SQL Server logon rights and Management Server logon rights. After you have created the domain accounts, enter the username and passwords click next. 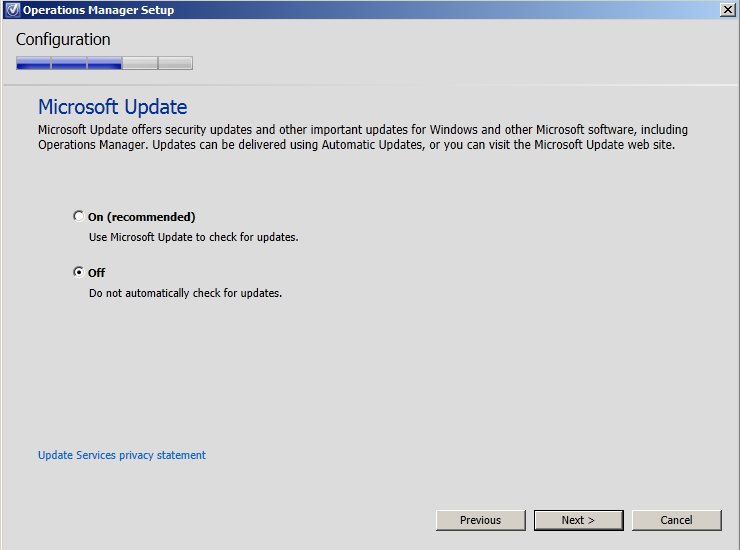 Next we have Microsoft update, since we are using SCCM to do patch management I turned this off. Click next and you get the summary screen, double-check the information here that click install. 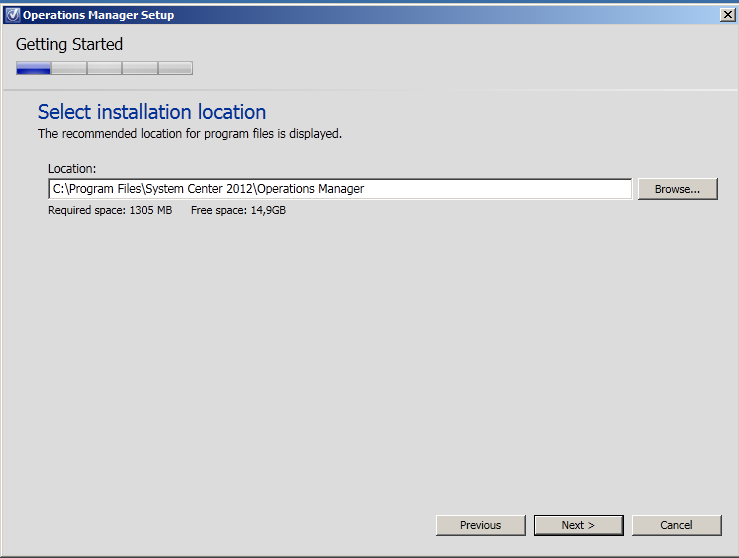 When the setup is finished, mark the “Start the console” and close the installer. This step needs to be performed as a user with domain rights. 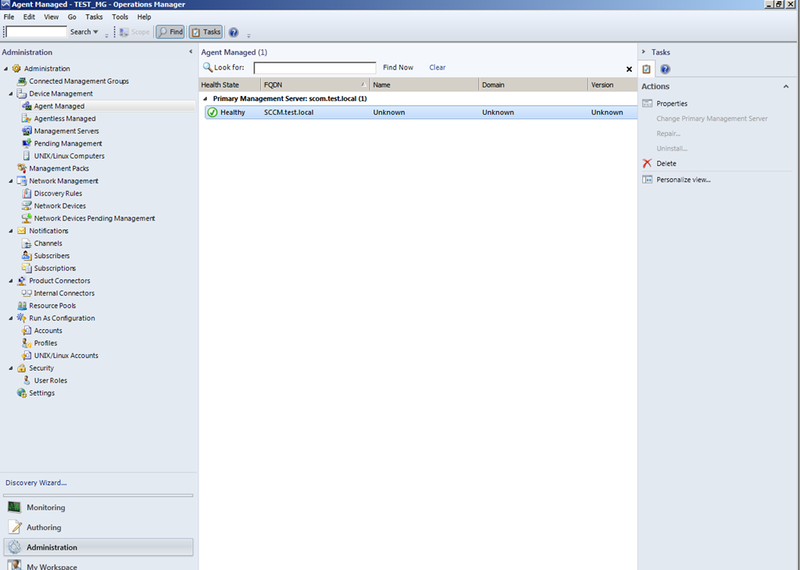 Creates a container under the Operations Manager container the tool just created with the name of the management group specified. 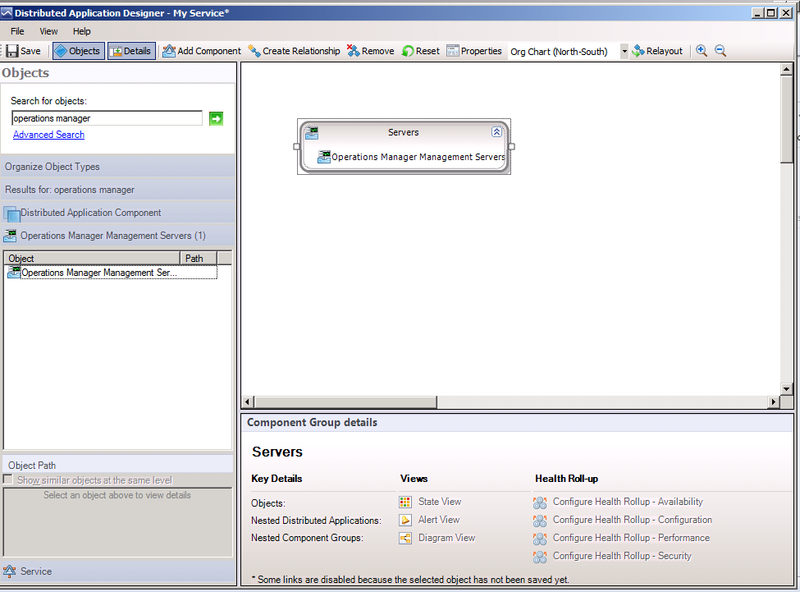 Within the management group container, the tool creates two service connection points (SCP) and one security group. Note thou, this only creates the folder in AD, I doesn’t add the Management servers, so the agents still don’t know which server it should contact. 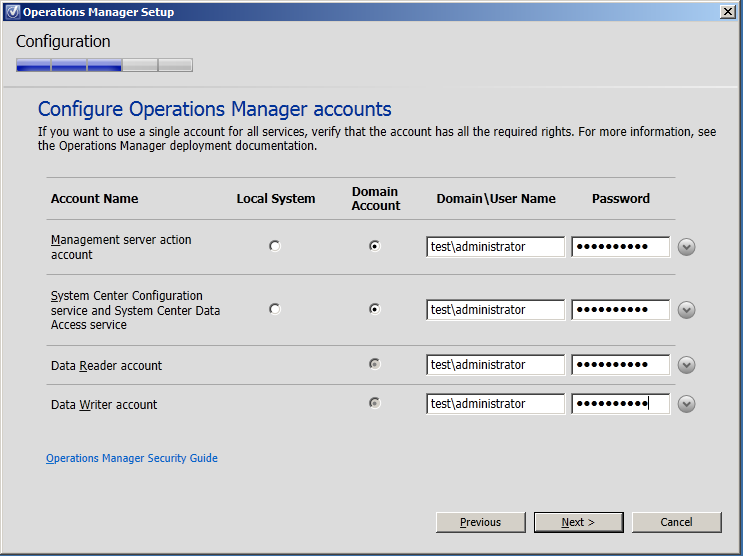 Go into the administration tab and into Management Servers, –> right click on the server (which is a MS) and press properties. as you can see here it says that the Momadadmin has to been run before you can continue this wizard. 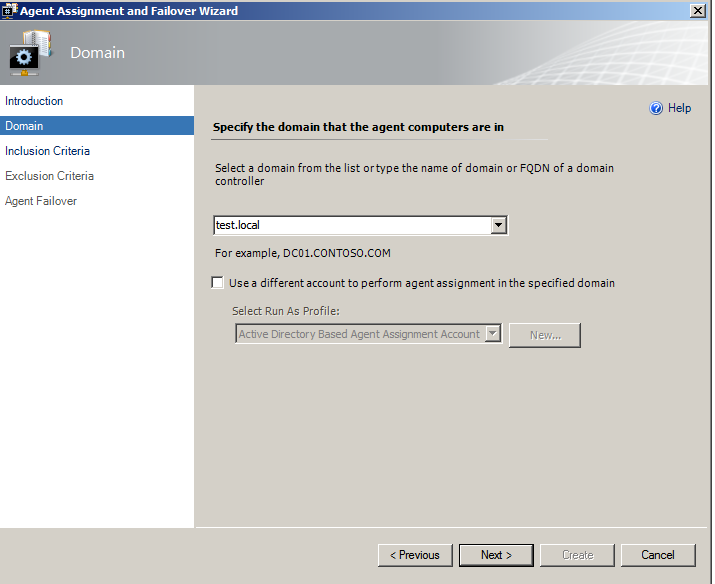 Click next, Select the domain of the computers from the Domain name drop-down list. 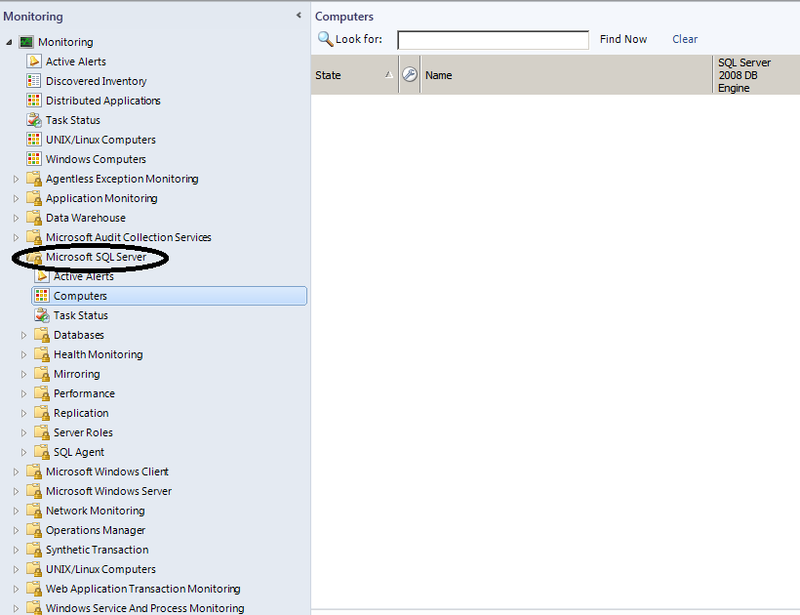 Set Select Run As Profile to the Run As profile associated with the Run As account that was provided when MOMADAdmin.exe was run for the domain. 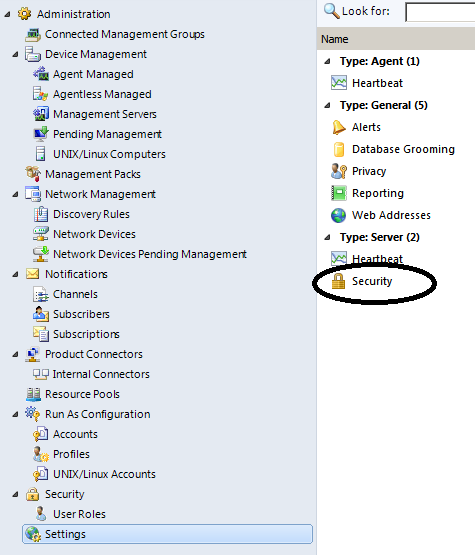 The default account that is used to perform agent assignment is the computer account for the root management server, also referred to as the Active Directory Based Agent Assignment Account. If this was not the account that was used to run MOMADAdmin.exe, select Use a different account to perform agent assignment in the specified domain, and then select or create the account from the Select Run As Profile drop-down list. 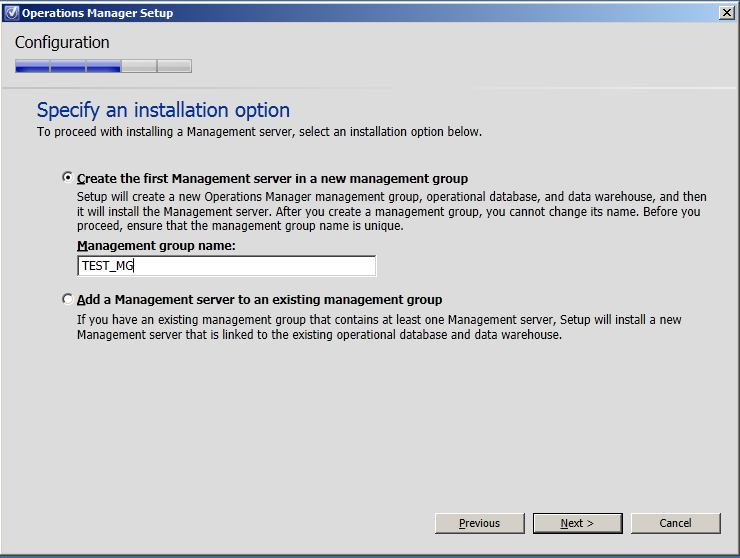 On the Inclusion Criteria page, either type the LDAP query for assigning computers to this management server in the text box. 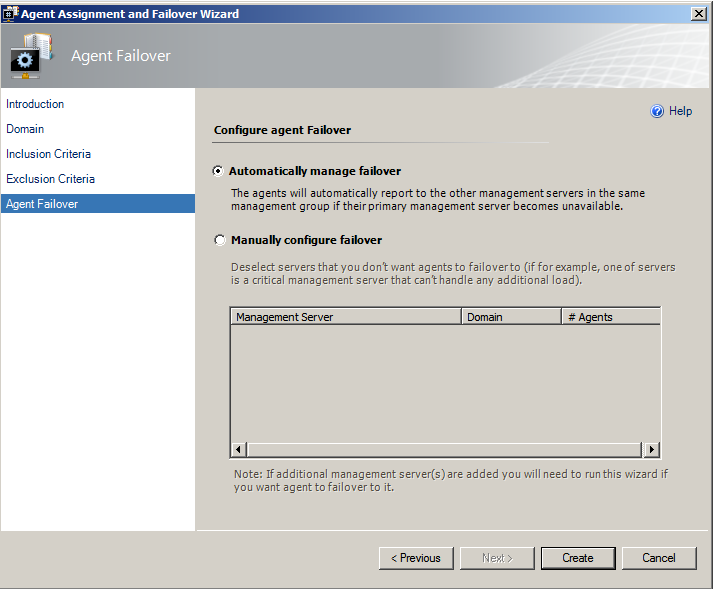 On the Agent Failover page, either select Automatically manage failoverand click Create or select Manually configure failover. 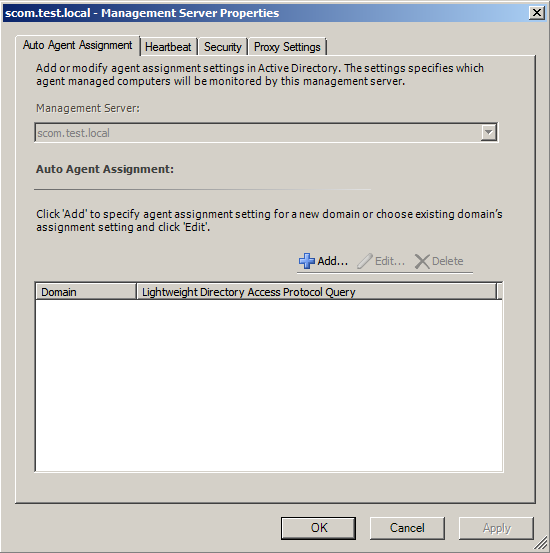 Now remember that It can take up to one hour for the agent assignment setting to propagate in Active Directory Domain Services. 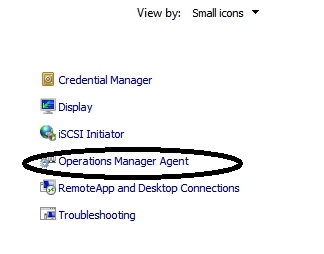 Since it might take some time, we are going to install the agent manually, but before we can do that we have to change the security settings for the scom site. Click the Security tab, and press properties. Here change the value from Reject to automatically approve. Then click OK. After that is done, go to the server that you want to agent to be installed. And run this command in a cmd shell as administrator. 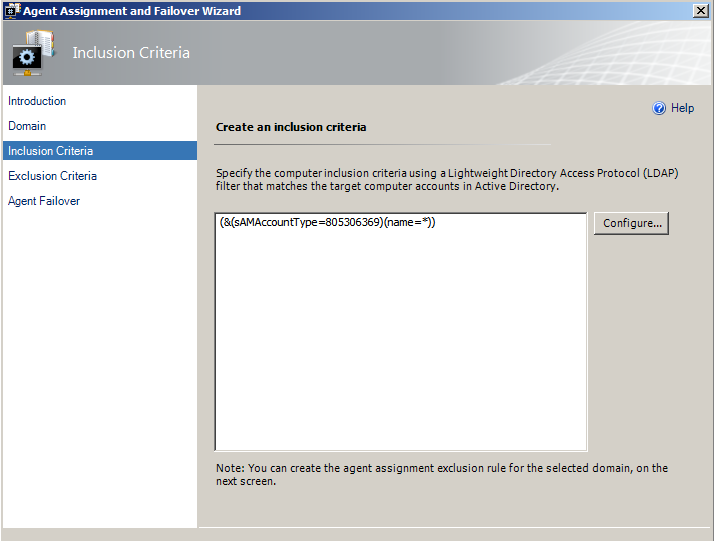 NOTE: Active Directory Integration is disabled for agents that were installed from the Operations console. 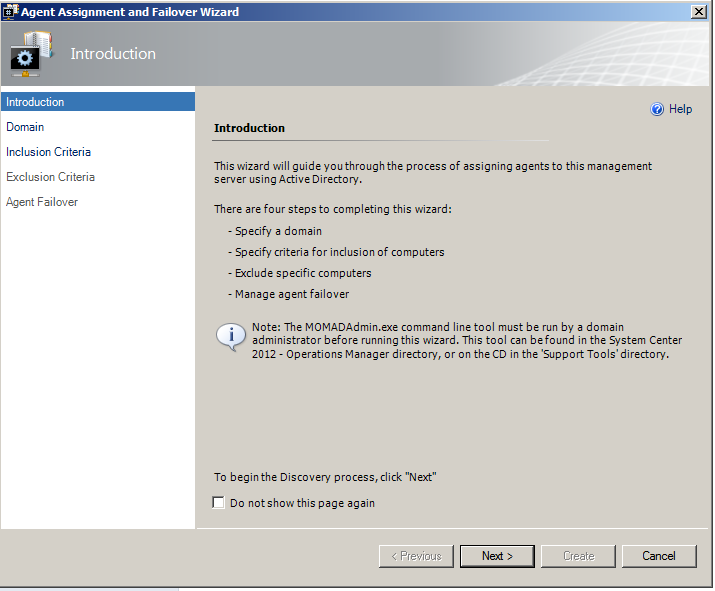 By default, Active Directory Integration is enabled for agents installed manually by using MOMAgent.msi. After the installation it might take some time before the agent appears in the console, when it does it will appear, under the administration and Agent Managed tab. You can also check the control panel applet on the server, this displayed info about the agent. 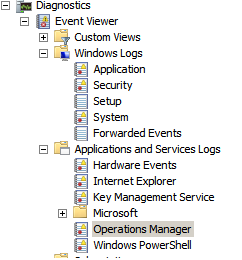 And under the event log under Windows logs –> Applications and services logs –> Operations Manager –> and se if you have any error messages appear. When it is finished and you have no error messages, to into the console again, monitoring -> Windows Computers -> you will see the agent appears as Healthy here. So it seems like the agent is working as it should. 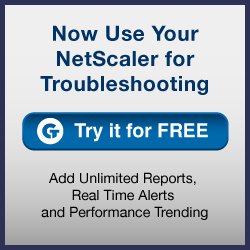 By the way, the server I installed was an SQL server. 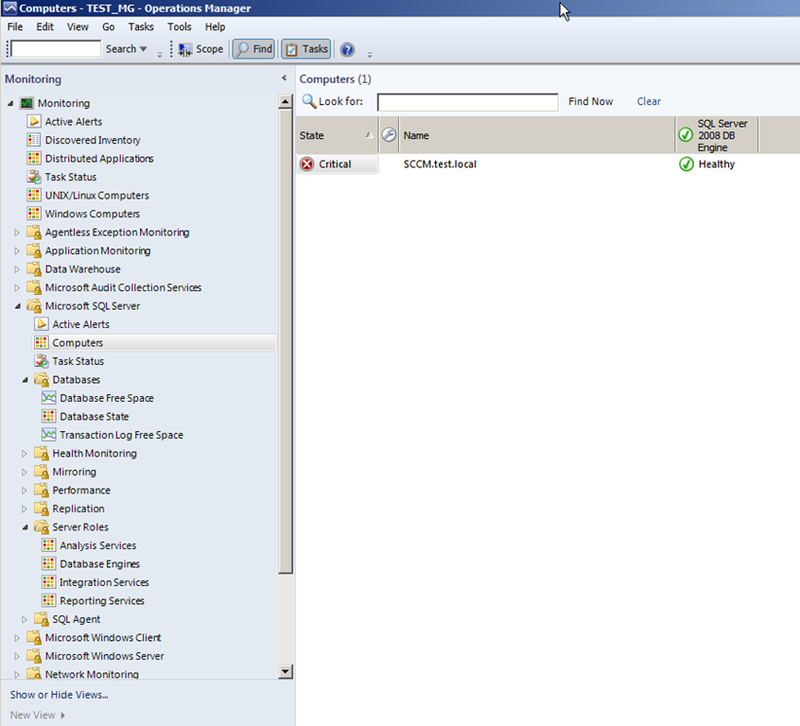 By default SCOM doesn’t contain anything useful to monitor SQL servers. 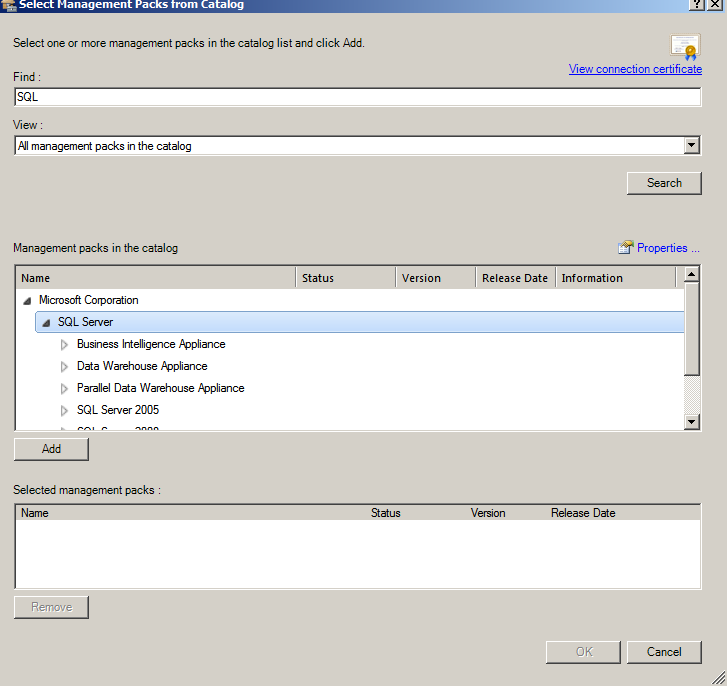 Therefore we need to download a management pack for SQL server 2008, inorder for SCOM to manage the server properly. 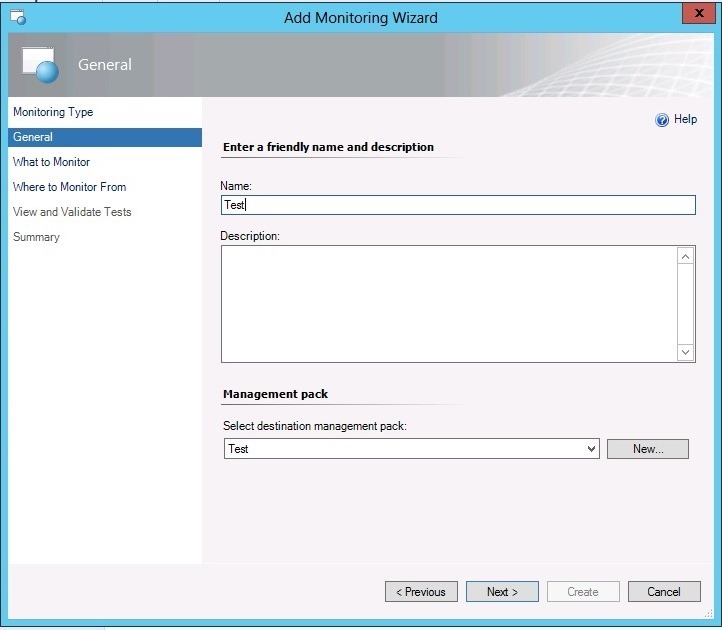 A Management Pack is a file that contains parameters, values, task, rules, monitors for a known product. 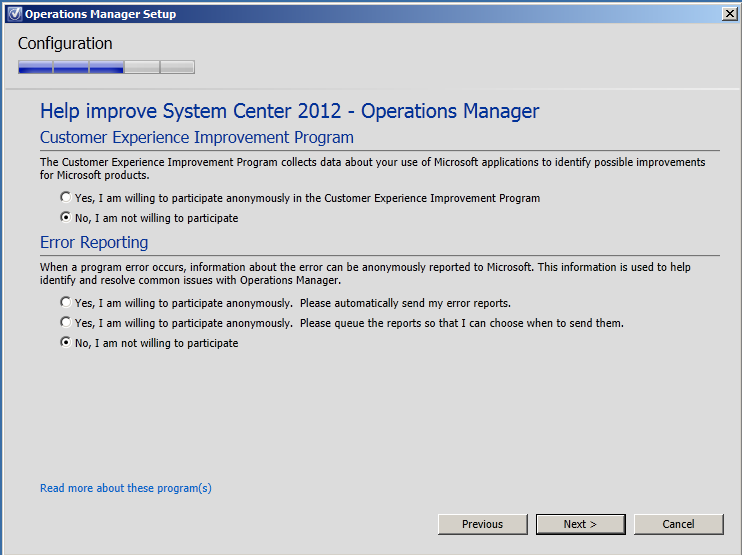 So they contain all the information that scom needs to monitor a certain product. 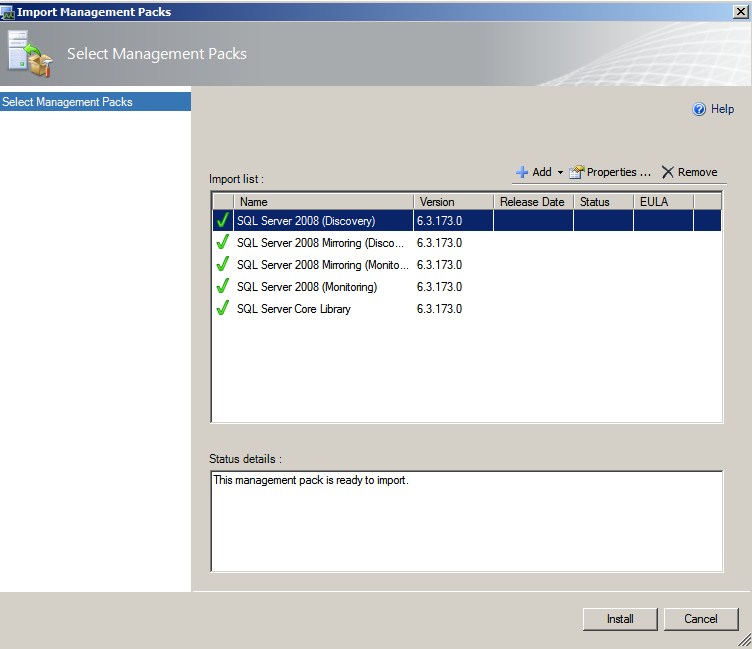 And a number of Management Packs appear, and I choose the SQL 2008 server MP. I choose Add all of these and download them to the desktop of my server. 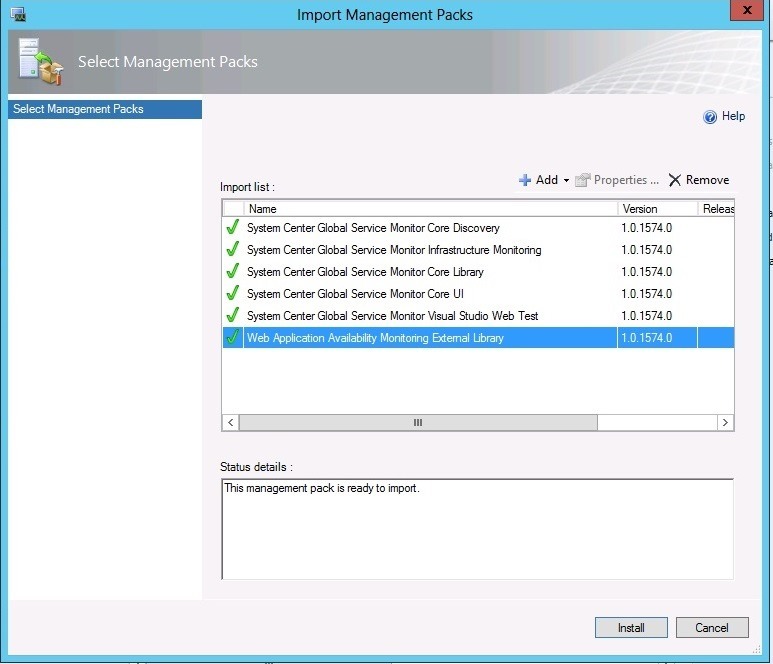 Now after we downloaded them , we have to import them into the OpsMgr site. And browse to those you’ve downloaded and click install. 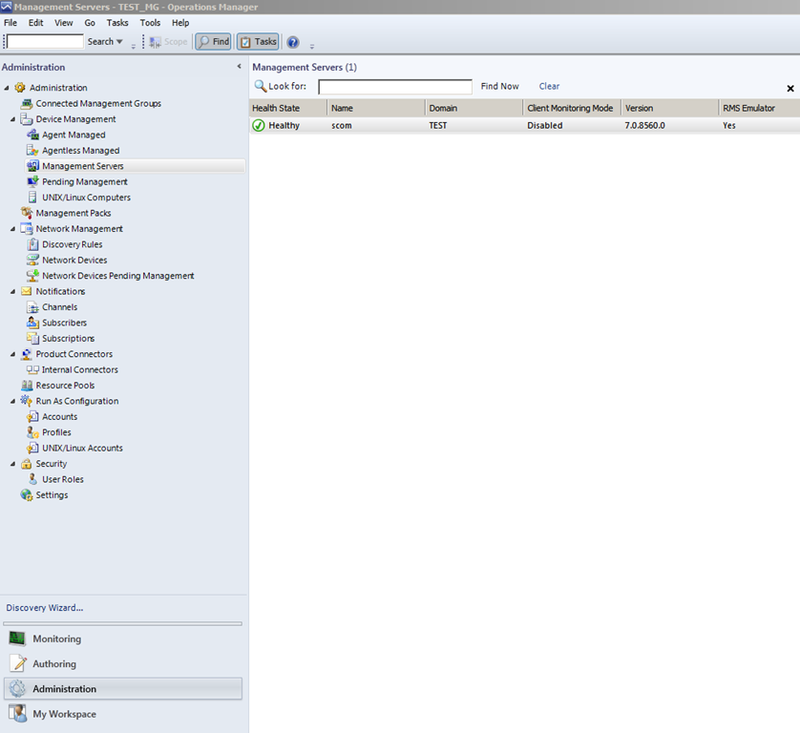 After OpsMgr has updated the database, and distributed the new SQL MP to the agent, the server will appear here. 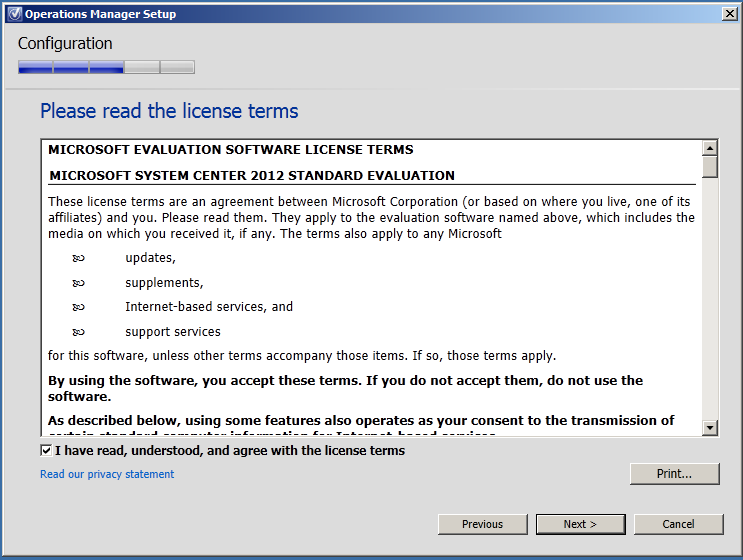 Just thought I post a quick post about system requirements regarding the System Center products, this is because im setting up a new lab enviroment with the 2012 edition of System center. And ill try to blog about installation and setup of these systems and how the integrate to each other. This post is most for myself so I can remember the requirements for each product. 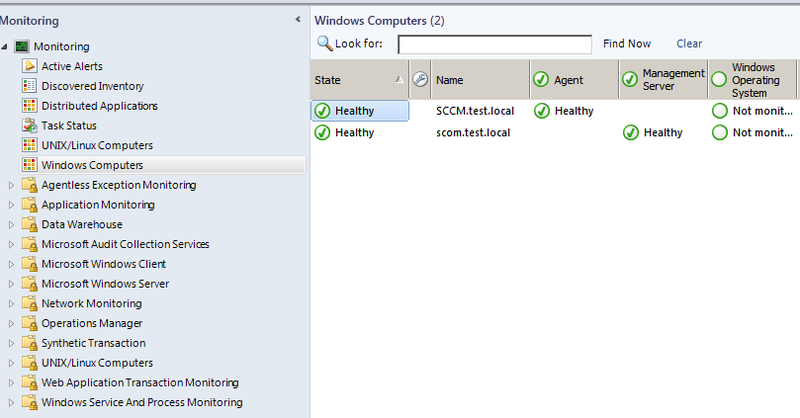 This new test lab will be running on a Windows 8 Hyper-v cluster. 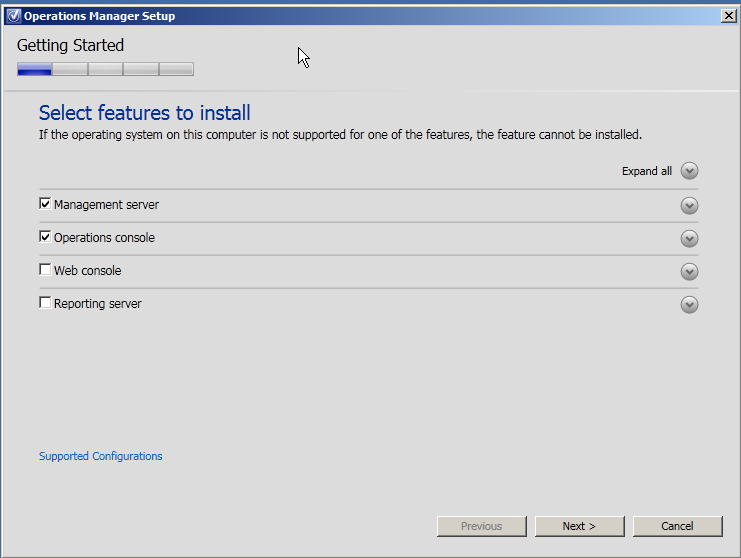 Server Operating System: must be Windows Server 2008 R2 SP1. Windows PowerShell version: Windows PowerShell version 2.0. Server Operating System: must be Windows Vista, Windows 7, Windows Server 2008, Windows Server 2008 R2, or Windows Server 2008 R2 SP1. 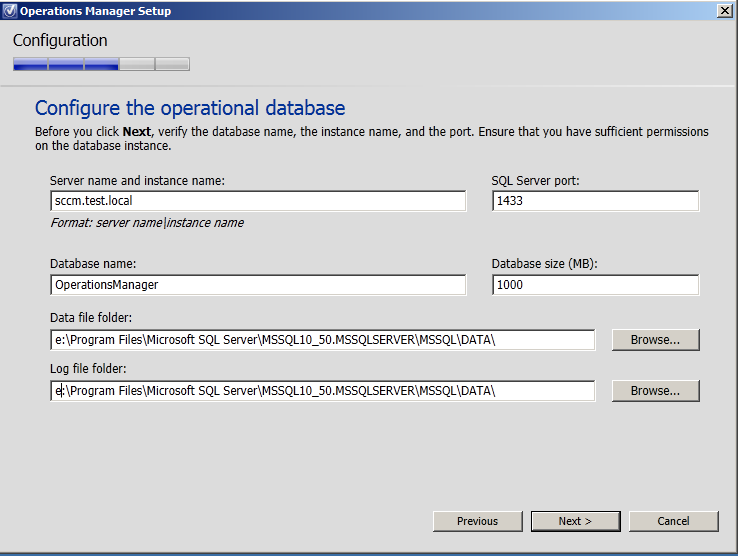 Microsoft SQL Server: SQL Server 2008 SP1, SQL Server 2008 R2, or SQL Server 2008 R2 SP1. 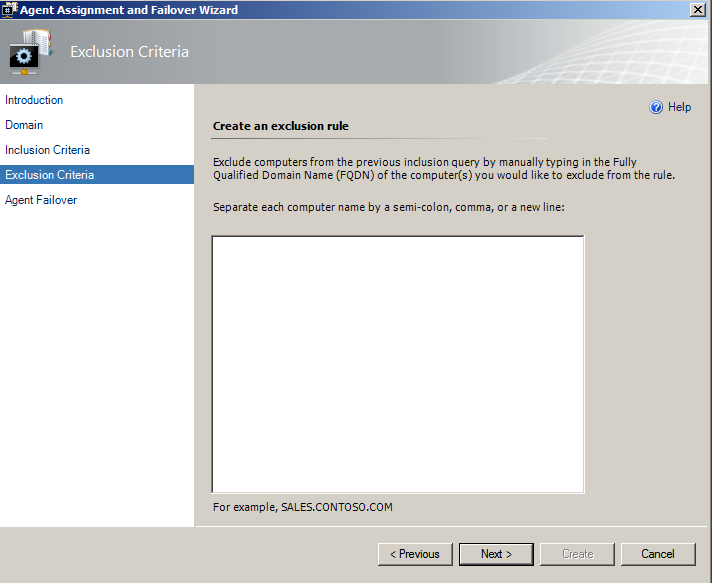 The instance of SQL Server in use at each site must use the following collation: SQL_Latin1_General_CP1_CI_AS. 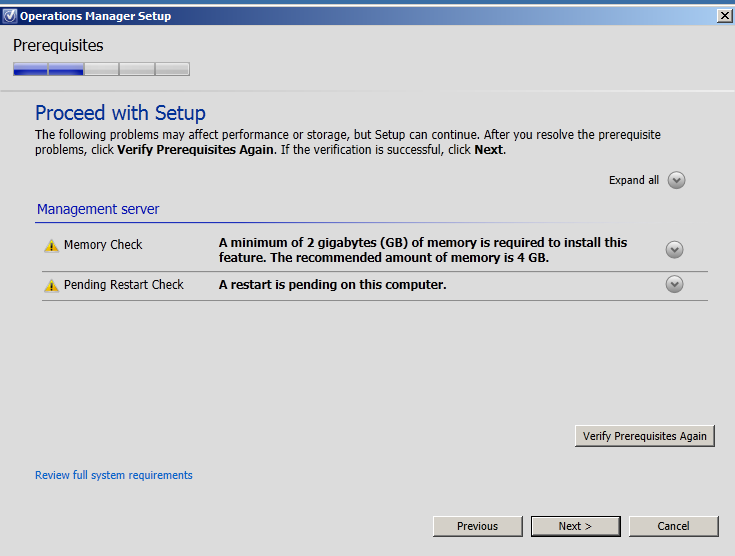 64-bit version of SQL Server 2008 R2, Enterprise or Standard Edition.